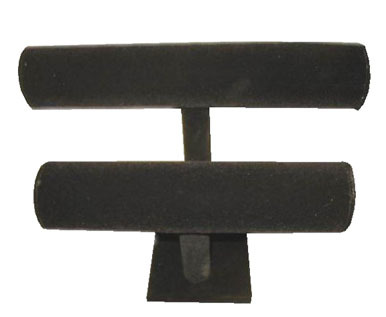 This double bar black velvet bracelet rack makes a great display on the checkout counter or in your booth. Or organize your own bracelets at home and keep them handy in a small space. It is easy to put bracelets on and take them off the rack. The longest bar is 10" wide (25.4 cm) and the shorter bar is 9" long (22.86). The bars the bracelets rest on are about 2" (5.08 cm) in diameter. The rack stands about 7.5" tall (19.05 cm).